20 years ago, Chicano veteran@s from the Chicano civil rights movement came together to organize the 20th Anniversary of the Chicano Moratorium. I was a young girl at the time but was still part of the organizing as much as I could be. Together these veteran@s realized the importance of their work and stories and documented it in a documentary called “20 years y que?” Today, on the eve of the 20th Anniversary of the Zapatista Uprising I am called to reflect on the years of Zapatista activism and solidarity work here in Los Angeles and the inspiring compas down south who our commemorating 20 years since the uprising. Today I am also reminded of that title, 20 years y que?! Personally, I am called to reflect on our Z activism and work here in LA. In 1997, a few dozen Chican@ artists and activists organized for months to have the First Chican@/Zapatista Encuentro Por La Humanidad y Contra el Neoliberalismo. 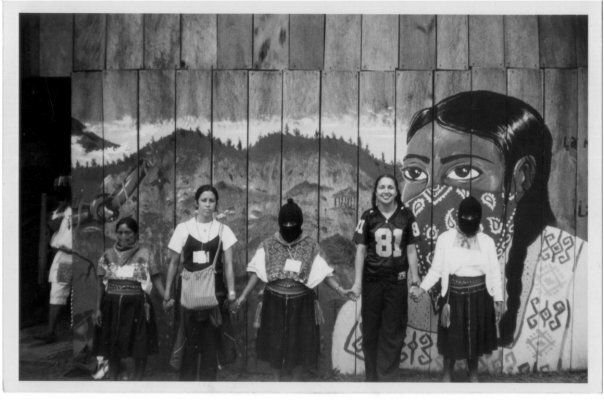 The Xican@/Zapatista Encuentro in 1997 was a very important and seminal event for many young Chican@ artivists and activists in Los Angeles of that time. We organized, created and helped to facilitate this interdisciplinary cultural gathering with dialogue and art. We shared commonalities and differences with the Zapatistas in dialogue for ½ the day and then collaborated in art making the 2nd ½ of the day in mediums such as murals, theater, poetry, dance and music/song writing—some of those songs created with and later recorded by the band Quetzal. This encuentro/gathering deeply affected and inspired the artists and activists who took part and many of them continued to do solidarity and artivist work when they returned and continue to still do today. These include groups like Mujeres de Maiz and In Lak Ech another women of color artivist collective that founded Mujeres de Maiz (MDM) which were founded around this time and were deeply influenced by the Zapatista women and revolution. Many other organizing and art collectives came out of this time or were born a few years later as a direct result of much of the work that had been done to organize the Encuentro and the lasting effects and influence on generations to come. Much has changed since the yearly Rojo Amanecer New Years Eve, fully sober and Zapatista commemoration events. These days many events are a protest party or another reason to celebrate. And though the Zapatistas showed us well how important it is to celebrate life and culture and did so till 3 in the morning bumping corridos and dancing till dawn, they do it with dignity and without drugs and alcohol. In fact the Revolutionary Laws for Women which came out before the 1994 uprising, were an uprising of their own—with women of the Z’s expressing their very gendered concerns, issues and demands especially around the infiltration of alcohol into their communities and the spread of various types of violence and domestic issues associated with it. Accountability and indigenous based talking circles are key to working though these type of issues and also to Z organizing. “The good government” could go days deciding next organizing steps, or a punishment for someone, etc. It is a communal and humane process. Unfortunately, these types of processes have not necessarily taken root as they should or need to within LA activism. Though there are circles that are beginning that process, it seems to be a select few and it may be much time before acceptance and implementation to this process. In the meantime, many women and people are silenced, not knowing where to go for help from others or to get help for themselves…and so the vicious cycles continue– until we step up to stop them. The heavy influence of the Zapatistas on Los Angeles work is present in generations of artists and activists, but has definitely waned as has the visibility of the Z’s here in LA. 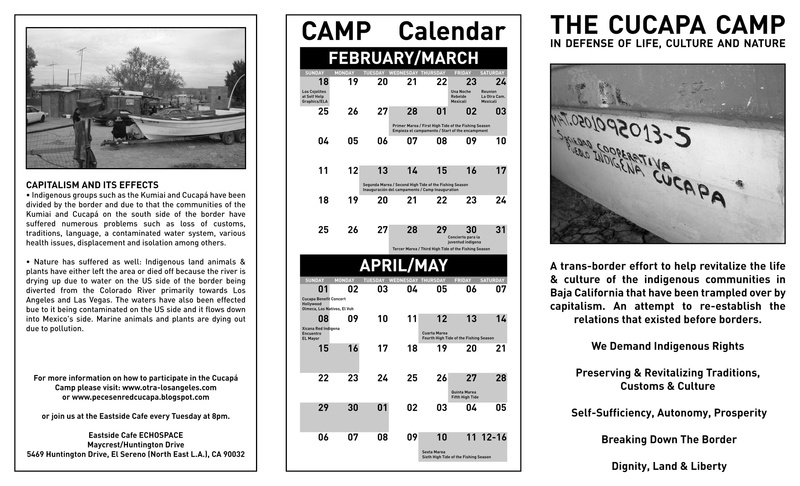 Almost 6 years ago, Los Angeles Chican@s and those in solidarity took part in one of the most understated but possibly key and very complicated examples of solidarity and close work with the Zapatistas—the Cucapa Encampment. The encampment is when Subcomandante Marcos and other representatives of the Z’s called for an encampment in solidarity with the Indigenous fishing community outside of MexiCali, Baja California, Mexico who were fighting privatization and globalization of their livelihood, culture, and waters. 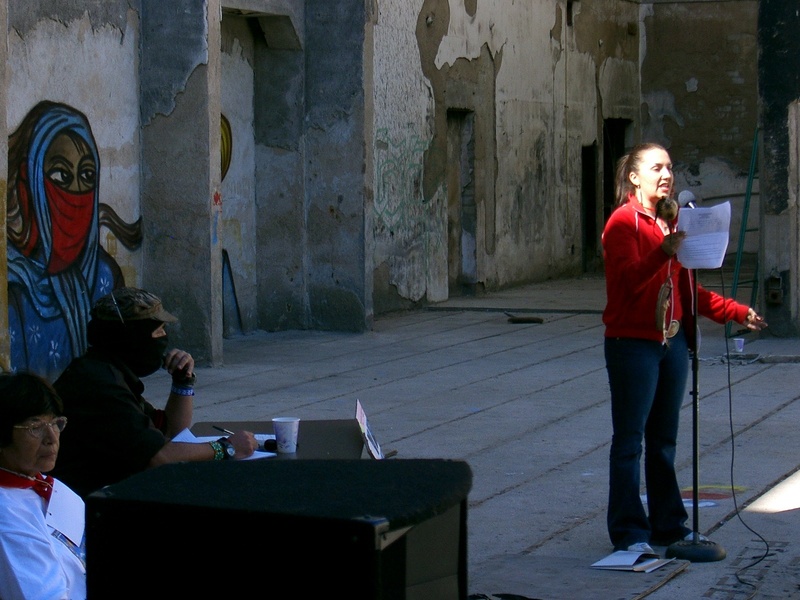 In this work, organizations who ideologically did not agree with each other, from Communist party members, to anarchist punks, to Chilango writers and intellectuals, to governmentally unrecognized Mexican Indigenous nations, to Chicano artistas and activists came together and worked for all who were “abajo y a la izquierda”—“to the bottom and to the left.” They looked passed years of grudges, misunderstandings and political differences to work together for “a world where many worlds fit.” These days I see LA needs a dose of the good parts of the encampment. As much as many of us still see that Cucapa encampment to be a very layered and complicated project that some say may have even been the very reason Los Angeles Zapatismo waned— many of us see it from the very personal experiences and beautiful connections that happened over that time. How the Cucapas began to practice and recognize their own indigenous traditions, how Chican@s expanded and shared their own pan-indigenous traditions, and how so many of those who would usually be fighting and from very different walks of life and different political thoughts and modes, came together to work for the people. Of course it was this and much, much more. These days there have been lots of misunderstandings, grudges, past friends no longer working together, people who need healing bringing their issues to circles, etc and some of that has affected long time organizations and circles. It’s that whole he-said, she said, our group is downer than yours or more raw or more community, or the “real” community etc, etc. It shows how far we need to go and where we are at. All of us are the real community, we all are real human beings, with real successes and real mistakes, with real gains and real pains, and all of this reflects within the circles and organizations we work with. People make mistakes and we are all decolonizing and in a learning process. That doesnt mean we have to be all we are the world and all get along and always support each others events and activism, etc….but maybe not counter-organizing or maybe calling for a dialogue before spreading word of things that sometimes you don’t have all the information and answers to. We all have our own role and way in this movement and remaining reflective and critical of each other is good and important and can be transformative when done in a constructive and positive way. What was also amazing at that time was to see so many people across Mexico and those “del otro lado” finally coming together, sharing and being heard. La Otra Campana and the route that Subcomandante Marcos took across the country to listen to people across the land was inspiring not only because someone was finally listening but also because of what was being said and who was saying it. Indigenous peoples and women, youth, punks, todos came out to share. The time “los del otro lado” had in the multi-kulti de Tijuana was an unforgettable experience. Many of us shared the joys and accomplishments of our work abajo y a la izquierda and many of us the challenges and pains. Still that day will be his/herstorical for so many reasons…. once again an example when the Z’s crossed imposed cultural borders to hear those who migrated and now called “el otro lado” home..including recent migrants and generation’s of Chican@s, Central Americano’s and Native Americans, etc. It’s also amazing beautiful to see how far we have come in 20 years, everyday I am reminded of this by seeing the new generation of spiritual artivists working in the community, gaining ancestral knowledge, working with plants and the land and doing things as we did years ago and our veteran@s of the movement years before that. But it seems that they are coming to this knowledge sooner, and are hopefully learning from our lessons and those from before. I see more people eating healthy from when I became a vegetarian almost 24 years ago it was a joke to many. I also see many more connecting with their spirituality and wanting to become whole, healed human beings…this is something that we are told would happen in this day and age but to really see its manifestation is something very beautiful. I see so many women healing and taking their rightful roles in organizing in ceremony, etc. This is also something that was prophesized–And though it is happening there is resistance and still many things we all need to work on to allow that to continue in a beautiful way. When some of the first Chican@s and LA area community went down south– their question to the Z’s was “how can we help you?” Time and time again, they have told us to work in our communities, organize and create alterNatives there– do the work back home in your community. And so it is…. since 1997 many organizations and circles were created and though newer LA Zapatistas may say where all the veteran@s at? — They are there. They are teaching ways of Zapatismo to 4th graders in Boyle Heights, they are sharing theater of the oppressed with generations of young people allowing them to see critically and have a voice, they are organizing mujeres circles for healing and health, they are on the radio waves of Aztlan creating and speaking about other ways of knowing, they are working in community gardens, …they and we are everywhere…. sometimes you don’t see us cuz we aren’t wearing the mask….but, we are there. We are teaching Zapatismo to our little ones, seeing them grow up singing and dancing traditional ways and how to take care of themselves inside and out. It is a continual process and struggle and it is not to say we are fully independent of the system and its neoliberal ways but it is a lifelong process and we are on it en el mismo camino….caminando preguntando. The little that I know and have learned, I try and share. I am very thankful for all my elders, tias, guides and veteran@s in the movement like my parents and also those on the red road and my own journey. It is beautiful to see our community want to heal and transform…. individually and communally. It is beautiful to see our community create alterNatives and do the good, hard work. I hope that it continues and that the healing and lessons are light and gentle. For this new Zapatista year, I hope that more and more– my and all of our walk matches our talk, our prayers our vision—and all towards a community that dialogues, grows and gathers together in digna rabia y harmonia. Que Viva Los Zapatistas! Que Viva Comandante Ramona! Que Viva Subcomandante Marcos! PS: I’m putting pics of me, cuz I don’t have approval of those other than me to post.